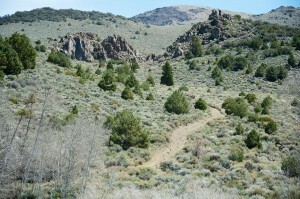 The Pine Nut Mountains Trails Association — PNMTA — is a non-profit organization that formed in 1998 in response to threat of losing access to our public lands in the Carson Valley. The PNMTA has been working with the Bureau of Land Management (BLM) and other government agencies ever since to protect our rights to enjoy the beautiful public lands in our area. The PNMTA is represents all types of recreational users. Our members include bicyclists, OHV users, Equestrians, Hunters, and any person that is interested in preserving public lands. Taking care of the land is a key part of our strategy. No other group has done as much to improve the environment in the Pine Nut Mountains. The PNMTA has organized annual cleanups and trail projects resulting in the removal of thousands of cubic yards of trash and dozens of abandoned vehicle. We have also done trail improvement projects, including signing trails and creating official staging areas. And we have fun! The PNMTA organizes many different activities to keep us all connected. We have picnics, camping trips, and day trips scheduled throughout the year. Check our facebook page for the latest information on upcoming events. Actively work to stop public land closures and restrictions in Douglas, Washoe, Lyon, Mineral and Mono Counties. Create awareness of potential policy changes that would restrict multi-use policies already in place. Promote safe and responsible use of public lands. Remove and properly dispose of more than 22 cars from public lands. Remove and properly dispose of trash from public land. Develop, in conjunction with the BLM, several OHV trail heads in the Pine Nut Mountains, installing kiosks to communicate awareness of proper public use. Develop an OHV Volunteer Program to create awareness and promote responsible use of public lands. Raise money to fund our many projects and support our efforts to keep our public lands open for public use.